Join us. 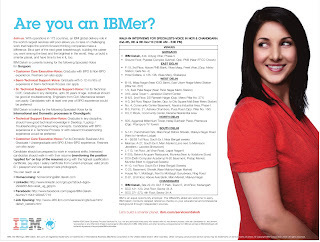 With operations in 173 countries, an IBM global delivery role in the world's largest services skill pool allows you to take on challenging work that helps the world's forward thinking companies make a difference. Be a part of the next great breakthrough, building the career you want among the best and the brightest in the world. Help us build a smarter planet, and have time to live in it. too. certificate, pay slips / salary certificate from current employer, valid photo ID / passport and one passport size photograph.